It has been a long week for this DIY columnist and her equally craft-savvy friend, Alison, so a revitalizing face mask DIY seemed like the best solution. Long weeks of little sleep, lots of studying (and stressing), washing your face with Missouri’s filmy tap water and dancing at clubs into the early morning can take a toll on a girl’s face. But this toll can be paid using a coffee and cocoa face mask. 8 tablespoons of some sort of dairy product; whole milk, unflavored yogurt, heavy cream, etc. The way you tailor the mask to your own skin is choosing between honey —if your skin is dry or normal —or lemon juice —if your skin is oily. 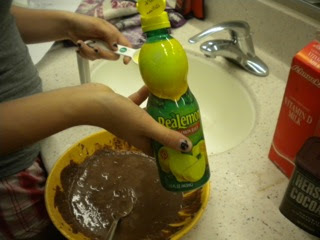 The recipe makes a whole lot of mask, so feel free to divvy it up to share with roommates, floormates or whoever! After pulling your hair off your face with some headbands and hair ties, stake out the bathroom with all of your supplies. Explaining that you aren’t insane to every random that comes in the bathroom to brush their teeth is half, if not all, the fun. Start by adding the coffee and cocoa powder in a bowl. Let the coffee and cocoa powder be friends and stir them up with the spoon so that it is all intermingled. Then, add your choice of dairy product and stir with a spoon until it creates a smooth-ish paste. 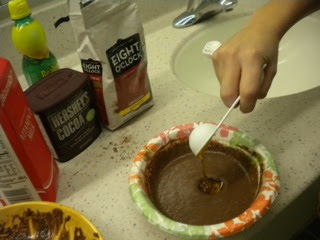 Make sure you are getting all the dry bits mixed in, as if you were making that good old Swiss Miss instant hot cocoa. Next, stir in the honey or lemon juice, depending on your skin type. Finally, get your hands dirty and relive your playground mud pie days by slathering the mask evenly over your face and neck. Don’t get too close to the eyes, but the caffeine can be beneficial to the under eye area, so apply a bit there. Let the mask dry. It should go from feeling wet to the touch to feeling maybe a bit sticky, kind of like drying tacky glue (if you are a true DIY-er you know what I mean). Your face will have a tingly sensation as it dries. It is like your skin is a gospel choir singing its praises to most college kids’ drug of choice ... caffeine. Once it is dry, wet a washcloth with warm water and press it to your face to melt the mask off. Don’t rub too much, especially if your skin is sensitive. Continue to use the washcloth to pat off the majority of the mask. Finish by rinsing whatever is left on your face with cooler water to minimize and close up your pores. It might be overdramatic to say that this mask worked miracles, but there is no better way to describe its effects. Your skin is more awake and it will feel like your pores are playing a game of hide-and-go-seek with you. 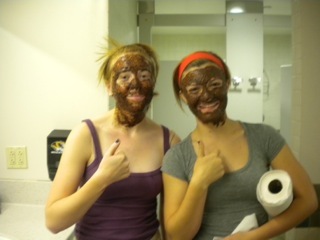 Alison and I literally ran through the hall making people feel our skin in disbelief for how amazing it felt. It is a great thing to do weekly, especially on a Sunday night after a long, tiring week because it will wake up your skin and prepare it for the week ahead. So go out and ask strangers to feel your newfound, amazing skin and, as always, go Tigers! MIZ-DIY! 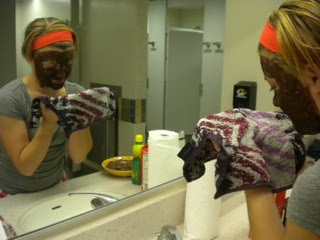 I have never heard about this combo of coffee and cocoa face mask. thanks for sharing this info. I am gonna try this for sure. If you any other beauty tips please share. This is really very helpful.